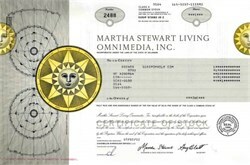 Beautifully engraved certificate from the Martha Stewart Living Omnimedia, Inc. 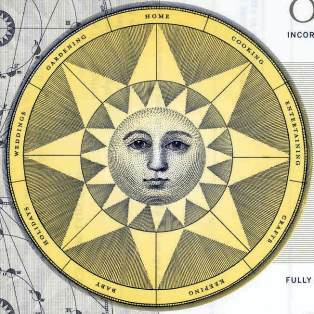 This historic document has an ornate border around it with a vignette of a sundial. This item has the printed signatures of the Company’s Chairman & Chief Executive Officer, Martha Stewart and Secretary, Greg Blatt. Martha Stewart was a close friend of ImClone ex-CEO Samuel Waksal, and is currently under investigation as to whether she made the insider trading sales based on knowledge that the Food and Drug Administration was set to reject ImClone's once-promising cancer drug, Erbitux. Two Merrill Lynch (NYSE: MER) employees were placed on administrative after giving conflicting accounts of the existence of a stop-loss order allegedly placed by Stewart on the controversially well-timed sale of her shares of biotech company ImClone in December. Though both Stewart and her Merrill broker, Peter Bacanovic, claim that they made an oral agreement to the stop-loss order in November, comments by sales assistant, Douglas Faneuil, have led Merrill officials to believe that the agreement may never have actually existed. Faneuil, who placed the sell order on the stock back in December, stated that he was unaware of any such agreement at the time. Federal prosecutors widened their probe to include possible obstruction of justice and making false statements. Shares of Stewart's media company, Martha Stewart Living Omnimedia have dropped significantly since this insider trading scandal started. Martha Stewart Living Omnimedia, Inc. is an integrated content company consisting of how-to information and products for the home, organized around four business segments. The Company's Publishing segment includes Martha Stewart Living, Martha Stewart Weddings, and Martha Stewart Baby/Kids magazines as well as special interest publications; books written by Martha Stewart and the editors of Martha Stewart Living; and the syndicated askMartha newspaper columns and radio show. The Television segment includes a nationally syndicated, daily one-hour television program, Martha Stewart Living; a daily cable television program, from Martha's Kitchen, on the Food Network; weekly appearances on CBS's The Early Show broadcast; and periodic network primetime television specials. The Merchandising segment includes strategic retail partnerships through which merchandise designed by the Company's in-house creative experts is distributed and/or sold through Kmart, Sherwin-Williams, P/Kaufmann, and Zellers. The Internet/Direct Commerce segment consists of the company's high-end catalog, Martha by Mail, and marthastewart.com, which includes the Martha by Mail and marthasflowers online stores, as well as eight linked content and community channels. This segment also includes The Wedding List, a wedding registry and gift business. Martha Stewart Living Omnimedia, Inc. is listed on the New York Stock Exchange under the ticker symbol MSO.